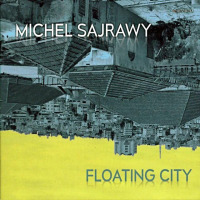 In his ongoing quest to create a singular jazz alignment bridging traditional and contemporary music of his homeland, Israeli guitarist Michel Sajrawy explores the multicultural background of the city of Nazareth, in Floating City. Though Jerusalem gets all the headlines and global attention, Nazareth stands apart as a city epitomizing co-existence in a region ravaged by religious strife, and turmoil. With his previous releases exposing a western slant on Arabic maqam music, this record has Sajrawy burrowing into his heritage, playing the music with a more exotic sensibility. In a production twist, he doubles on bass throughout, (save for one track) and displays virtuosity on that instrument as well. A Palestinian folkloric wedding ceremony is presented in the title track, with Arabic call and response setting up his blazing guitar work. Make no mistake, though he is a middle-eastern musician, Sajrawy is heavily influenced by British prog rock, American blues and jazz, and deftly brings that into the mix. "Bride Of The Galilee," is a minor blues dedicated to Nazareth, his beloved city, on the banks of the sea. There is a suspended middle section where Wassim Odeh on the oud, and Suhail Nassar on qanoun, display an engaging interplay, before slowly coming back to the shore. The sensation of mysterious travel describes "On The Road," as images of caravans and camels come to mind. Sajrawy exhibits his jazz repertoire on "Life Smiles Back," keyboardist Loai Abu Sinni complementing the arrangement with soulful organ lines. The somber melody on the melancholy ballad "Absence," conjures reflections of sitting by the sea, gazing into the past, missing someone from a lifetime ago. Sajrawy brings back his fusion mode, accompanied by Sinni on keys, and drummer Stas Zilberman, on "Zanjaran," and "Earth Wind & Fire," which are both more jazz inclined numbers. Guest bassist Sahar Anak is featured on the bluesy "I'm Not Sure," an stimulating composition that slips into a hard-bop piano segment, augmented by the oud in a true amalgamation of two worlds. They return to the Arabian maqam with "Sahra," this time joined by Wiasam Arram on darbuka, highlighted by Arabic chanting, in homage to the vast desert which dominates much of North Africa. 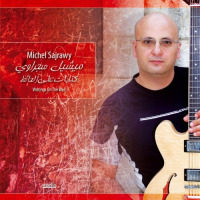 As with any consummate musician, Michel Sajrawy continues to evolve, not only on his instruments, but as a person seeking knowledge and wisdom. The music he refers to, and chooses to expand upon, hails from an ancient era, which has withstood the test of time, yet is pliable into contemporary forms. In this ode to Nazareth, he relies on the power of music to bring people together, an effort worth applauding. Track Listing: Floating City; Bride Of The Galilee; On The Road; Life Smiles Back; Absence; Zanjaran; Earth, Wind, & Fire; I’m Not Sure; Sahra. Personnel: Michel Sajrawy: guitar, bass; Wassim Odeh: oud; Suhail Nassar: qanoun; Loai Abu Sinni: keyboards; Sahar Anak: bass (8); Wisam Arram: darbuka (9); Stas Zilberman: drums.